Efficiency is about getting the best out of the area for dishwashing. When we develop new solutions, we place human, hygiene, environment and profitability in the center. With good strategy and a well-designed dishwashing area we create the conditions for a cost effective flow, high quality and good service from the dish washing area to the restaurant and the kitchen. We help you all the way from purchase and setup to start-up and maintenance. 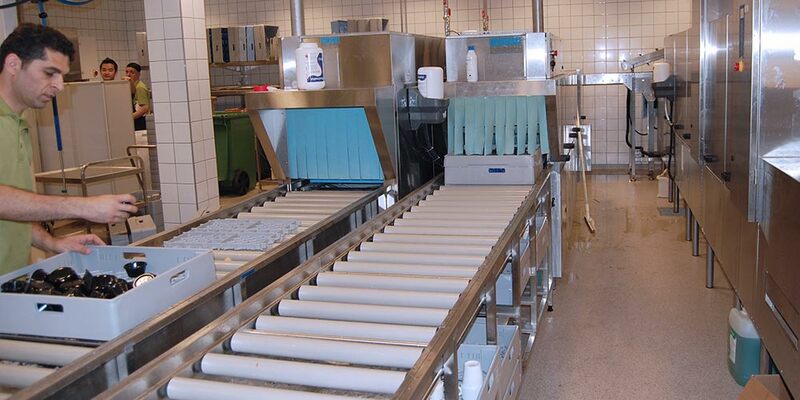 We test the equipment in our facility in Stockholm before the washing system is installed in your kitchen. That means we need less time when we install the equipment in your kitchen and save money for you and for us. Avoid double handling and heavy lifting. Design for flexibility and ergonomics where heavy lifting is automated, resulting in lower staff turnover and absenteeism. Modern washing room smells good, the temperature and humidity are balanced to create a good working enviromment. Dishwashing with high standards of hygiene handles clean dishes with minimal contacts. Food waste is ground and sucked directly to a tank - not intersecting flows. Cleaning of furnishings, equipment and facilities adapted with procedures that contribute to a microbiological good results. Modern disk arrays helps to lower consumption of both water and chemicals. We use Lagafors method, a market-foam cleaning technology that is also used in the food industry. The method is better for the environment by the consumption of chemicals drops by controlled dosing. The surfaces become microbiologically cleaner in less time, increased pressure consume less water. Rough disk is usually ergonomically stressful and time consuming. First soaking and washing dishes by hand, since traditional dishwashers, a process that consumes chemicals and hot water and is expensive, time consuming, and harmful to our environment. Diskomat install potwashers as blast potwashing clean with plastic granules without requiring much chemicals, water or man hours. 7 kg food waste becomes biogas equivalent of 1 liter of gasoline and fertilizer. We have the knowledge and Eco Waste Away, a proprietary waste system that handles up to 2 000 liters of food waste per hour. EcoWaste owner can manage food waste for both a kindergarten as the restaurant and catering industry by grinding and sucking it into a storage tank. Planning a new disk system? We help you develop an energy efficient and profitable cleaning system for your kitchen.